Tip workers legally earn just $2.13 an hour, a figure that has not changed in over 20 years. A book by Saru Jayaraman titled, “Behind the Kitchen Door” helps readers see through the eyes of the worker and the need for a change in a system making workers dependent on their customers’ tips to make a living. “Behind the Kitchen Door” will be part of the United Methodist Women’s 2015 reading program. Have a conversation with restaurant management at your favorite places to eat; ask if they pay minimum wage. Send a constructive tweet or facebook comment. Include the restaurant’s labor practices in recommending or reviewing it for others. Join The Welcome Table, an association of eaters joining forces to hold the restaurant industry accountable to sustainable labor practices. Chances are you care about whether your food is organic and locally sourced. You probably check the restaurant’s health rating before you dine out but how often do you think— or even look at — the hands that put that food on your table? According to the U.S. Bureau of Labor Statistics, restaurant workers hold seven of the 10 lowest-paying jobs. Tip workers legally earn $2.13 an hour and that figure has not changed in over 20 years. Most do not have paid sick leave, which means they work when they are sick. Most are not offered training and opportunities to advance. The U.S. Senate is considering a bill that would raise the minimum wage and bill sponsors say they are unwilling to strip out a raise to “tipped” employees. Saru Jayaraman, author of “Behind the Kitchen Door,” is leading an effort to include tip-workers in the minimum wage bill. “No worker should be dependent on living off the mercy of customers,” she said. Jayaraman spoke to the United Methodist Women’s 2014 Assembly on April 26. There was a stampede to the onsite Cokesbury store to buy her book when the town hall meeting ended. Jayaraman is co-founder and co-director of Restaurant Opportunities Center United, an organization campaigning to lift waiters, cooks, dishwashers and others working in the nation’s restaurants out of a cycle of poverty. The Restaurant Opportunities Centers United website includes a national diner’s guide that provides information on wages, benefits and promotion practices at the most popular restaurants in America in at least nine major cities from Los Angeles to New York. “Behind the Kitchen Door,” will be part of the United Methodist Women’s 2015 reading program, a list of books selected by UMW board members and sold and promoted at UMW meetings. “It means we will have thousands of United Methodist women reading this book next year,” said Carol Barton, coordinator of UMW’s immigrant-civil rights initiative. Like so many people, Jayaraman’s life changed forever on 9/11. Before that day, she was just one of the millions who enjoyed eating out without giving much thought to the inner workings of the restaurant. 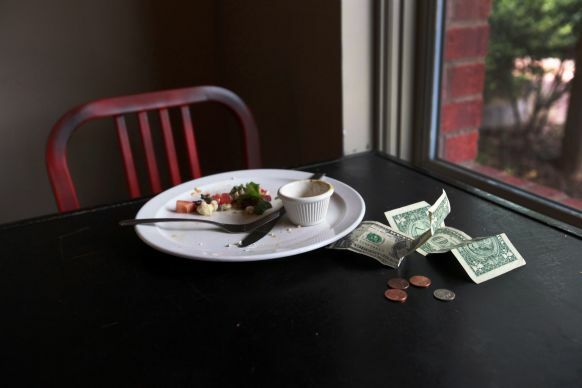 She said she was someone who usually left a 20 percent tip and felt good about herself. But on 9/11, 73 workers at the World Trade Center’s Windows on the World died and some 13,000 other restaurant workers in New York City lost their jobs because of the tragedy. The National Restaurant Association, “the other NRA,” has been successful at the “magic trick” of convincing Congress and states to keep this as the only industry that doesn’t have to pay their employees because customers pay tips, she said. “This is usually the first job for most young women. The industry has five times the rate of sexual harassment of other industries because women have to put up with whatever the customer does,” she said. As consumers, diners have an opportunity and a responsibility to speak up at their favorite restaurants and ask managers if their employees are getting minimum wage, paid sick leave, and opportunities to advance. “We need help from everyone,” Jayaraman said. “It is not about not eating out or tipping better, it’s about changing the industry,” she said. Gilbert is a multimedia reporter for United Methodist News Service. Contact her at (615)742-5470 or newsdesk@umcom.org.